Have you always wanted to be a better singer? Our voice faculty can help you achieve your goals and will create a singing/voice lesson program based on your vocal range and musical interests. 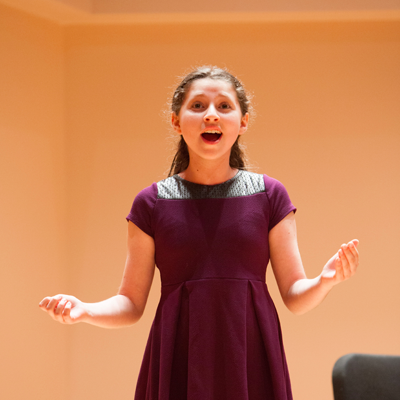 Our Voice lessons are offered to students above age 8 and are the most comprehensive voice lessons in Houston. A variety of genres can be explored including musical theatre, pop, opera or any other genre in your voice/singing lessons. Beginning students can expect to start with the fundamentals of voice/singing lessons, such as learning proper posture, correct breath management and vocalization. More advanced and experienced students continue to progress in their singing/voice lessons with a goal of proficiency in advanced vocal technique, notation, rhythm, diction and languages. Learn to sing the music you love! The earliest form of music known to man is vocal music. Before 900 A.D., vocal music was not written down. It was sung from person to person, often transmitting vital information about history and culture. In the Middle Ages, vocal music started its evolution into modern form. With the European Renaissance beginning in the 14th Century, Western vocal music expanded from monotonal chant to increasingly complex song structures and harmonies. Singing with instrumental accompaniment rose to prominence. As harmonies and musical structures evolved in European-influenced countries, so did songs. Vocal music expanded into the theater in the form of the opera, a musical play. Composers also wrote songs to be performed in the concert hall. Contemporary vocal music in European-influenced countries such as the United States has its roots in the Western tradition, which includes concepts such as musical notation on a five-line staff, an eight-note musical octave and harmonies based on major and minor scales. Vivaldi Music Academy offers music lessons in a variety of instruments. Our piano lessons, violin lessons, guitar lessons, viola lessons, cello lessons, voice/singing lessons, flute lessons, and drum lessons provide a comprehensive and robust music education . Group voice lessons/choir, ensemble/chamber lessons for experienced students, and early childhood music development classes round out the selection of experiences offered. Learn more about our music programs. From decorated recitalists to award winning composers, our faculty is dedicated to tailoring music lessons to your interests by learning about your personal musical goals and helping you achieve them. Our faculty have instrument specific degrees from renowned universities such as Yale University, Rice University and Boston Conservatory. Learn more about our amazing faculty. With over 200 years of family history in music, critically acclaimed violinist Zeljko Pavlovic brings his belief in the value of music education to the forefront of the Academy’s mission. As director and owner, Mr. Pavlovic has assembled a team of professional musicians who share his passion and enthusiasm for quality music education. Learn more about our director here. With two locations centered in Bellaire and West University, our schools are convenient to all areas of Houston. Our state of the art facilities includes a comfortable and professional parent’s lounge with free Wi-Fi, coffee/water, and magazines. Spacious studio rooms are equipped with top-of-the-line upright and baby grand pianos . All rooms are enhanced with updated technology such as iPads with music teaching apps and software, for engaging modern and classical music lessons. Learn more about our locations here. Students interact with peers by participating in performances, ensemble lessons, and masterclasses with faculty and other visiting artists. Recitals, included in the tuition, display and elaborate each student’s achievements in their instrument of choice including piano, guitar, violin, viola, voice/singing, flute, cello, drums and more. Our students have unique performance opportunities such as our Carnegie Hall Debut in 2015, concert performance with the Piano Guys at the Revention Music Center and our upcoming concert in Venice, Italy in the summer of 2016. Vivaldi Music Academy is proud to offer our students the best instruments for modern and classical music lessons. For more than a century and a half, the world’s most accomplished pianists have preferred to express their musical genius on pianos such as Knabe and Steinway pianos. The list includes the giants in classical, jazz, and popular music. Our teachers blend a variety of teaching methods and styles including the Suzuki method for violin lessons, developed by Japanese violinist Shinichi Suzuki. Learn more about Suzuki lessons and our Suzuki program director, Courtney Park. Prepare your young vocalist to light up the stage with Vivaldi Voices! This group singing class is a unique and unparalleled experience for children ages 6-10. Exploring a variety of genres, students will learn about basic melodic intervals, matching pitch, and learning dynamics. Students will engage the whole body to create a beautiful sound with an entertaining presentation for voice lessons in a group setting. Enrollment is determined by audition. The unique Vivaldi Seasons curriculum developed by our very own faculty emphasizes a variety of genres including world, contemporary, jazz and classical music. Live instrument demonstrations are integrated into classes along with lesson plans that align with performances of the Houston Symphony Orchestra, Houston Ballet and Houston Metropolitan Opera, River Oaks Chamber Orchestra and other local ensembles. Our wonderful baby music classes, toddler music classes, and pre-school music classes are truly a well ­rounded approach to understanding musical comparatives and enhance development of the whole child. There is a lot of movement in our childrens’ music classes and the lessons actively flow through the seasons of the year and holidays of all cultures! Vivaldi Music Academy offers music instruction with piano lessons, guitar lessons, violin lessons, viola lessons, voice/singing lessons, flute lessons, cello lessons, drum lessons and more seven days a week to accommodate your busy schedule. Music lessons are billed monthly with no semester commitment.